How do you get someone to do something? The range is from making a gentle hint through to barking out a peremptory order (and further on out to issuing an undisguised threat). In the latest issue of ROLSI Alexandra Kent and Kobin Kendrick tease out the subtle elements of actions done and undone in a blow-by-blow analysis of directives in interaction. Here Alexandra and Kobin recruit the British royals into an illustration of their study. During the 2016 Trooping the Colour Parade to celebrate Queen Elizabeth II’s official birthday, the British Royal Family stood on the Buckingham Palace Balcony together to watch an aircraft fly-past by the Royal Air Force (RAF). I know this isn’t the way that Conversation Analysis reports usually start, but you’ll see what I’m getting at in a moment or two. The next day British media were abuzz with a story from the Royal balcony. At a certain moment the camera catches Prince William crouching down next to young Prince George. The Queen touches his arm, rapidly gestures upwards, and appears to say “Stand up William”. Prince William’s immediate response is to rapidly stand upright. The Queen’s imperative has been characterised by various newspapers, websites and on social media as “telling off” (Express, 2016) or “scolding” (Daily Mail, 2016) the Prince. It was certainly an interactional action of some sort, but what, exactly? Prince William’s “right royal telling off” (Mirror, 2016) is a timely popular example of the phenomenon we discuss in our upcoming paper in ROLSI, where we examine imperatives that tell someone to do something whilst also simultaneously holding him or her accountable for a transgression. We contrast these accountability-oriented imperative directives with more prospective ones that tell someone to perform a newly relevant action – one that could not have been relevantly performed prior to the imperative being issued. Whilst turn design features can be used to enhance the orientation to accountability (e.g., address terms, exaggerated prosody, profanity or accounts), the sequential timing of the imperative itself can be sufficient to index the recipient’s accountability for failing to perform the directed action. Let’s take a closer look at what was going on on that Royal balcony. The Royal family were on the balcony for the specific purpose of being visible to the gathered public crowds and TV cameras while they watched the RAF fly past. Being attentive and appreciative as the aircraft fly overhead is a pre-established, well-known protocol for the Royals during their regular balcony appearances. Although the edited nature of broadcast footage makes a detailed analysis of the full imperative sequence tricky, we know that the Queen did not object when William initially crouched down to talk to George. In fact she briefly joins their conversation before the fly past begins. At some point however, it becomes clear that William has remained in a crouched position rather than standing to watch the fly past. It is his failure to relevantly return to an attentive standing posture during the fly past that the Queen addresses. The imperative sequence itself is very quick; William is back on his feet within two seconds of the Queen first tapping him on the arm to get his attention. So what was it about this very brief sequence (besides the potential for a ‘right royal’ pun) that led to the action being characterised in headlines as a ‘right royal telling off’ (Mirror, 2016)? Our analysis suggests that when an imperative is used to direct someone to do something that they could (and potentially should) have already done it carries an implicit orientation that they are accountable for failing to have relevantly performed the action. This orientation need not necessarily be marked explicitly through intonation, account solicitations, or other turn design features. If the relevance of the action (in this case visibly attending to the fly past) was established prior to the imperative then it can be heard to orient to the recipient’s inaction as a failure for which they are responsible. The use of an imperative to ‘tell someone off’ enables the admonishment to remain tacit and unvoiced in favour of prioritising the immediate performance of the directed action. This makes it the perfect tool for situations in which the most important thing is to get the action performed (ensuring the second in line to the throne is visibly attentive to the fly past), and a relevant but secondary consideration is letting the recipient know that it was their inaction in the first place that caused the problem, without requiring them to explicitly account for the transgression. Find out more about accountability-oriented imperative directives in the upcoming issue of ROLSI. Kent, A., & Kendrick, K. H. (2016). Imperative Directives: Orientations to Accountability. 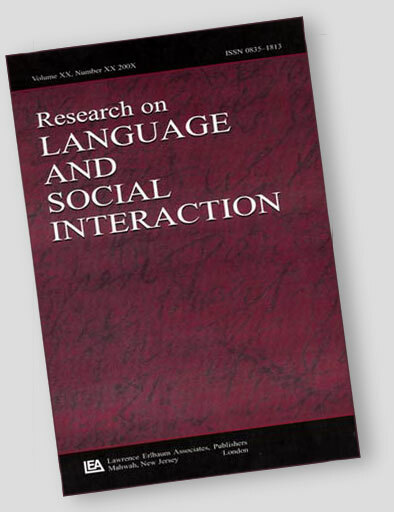 Research on Language and Social Interaction. 49 (3). online now.